Poor job match, poor work ethic, absenteeism, substance abuse, employee fraud and theft, weak managers, and employee turnover are some of the factors that contribute to substandard productivity. 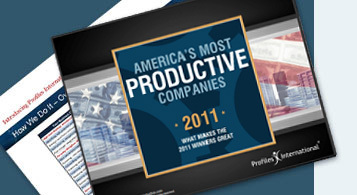 Today's global business leaders depend on significant productivity increases to maximize profit. Consequently, employees are asked to do more each day with less, resulting in a mismatch of resources and loss of productivity. Fortunately, employee productivity increases can be achieved by knowing more about your employees and what motivates them. "An effective manager will build personal relationships with his employees and give the encouragement needed for them to further develop their talents." When employees are placed in jobs that fit with their own natural gifts and talents, they tend to succeed. Rather than placing employees only where there is a need, consider how each employee individually matches his specific job. However, there is more to job fit than merely making sure the employee can do a job. You must also ensure that the employee wants to do the job. If he isn't happy, he isn't going to produce much more than an unqualified employee. With the PROFILE XT®, you can utilize job fit to place the right employees in the right positions. By measuring learning index, behavioural traits, and occupational interests, you can ensure that you are hiring successful, productive employees. Productivity is not just the responsibility of employees. Managers can impact productivity in both positive and negative ways. When employees are not a good fit with their manager, problems ensue, resulting in less output. It only takes one unhappy employee to lower the morale of the others. An effective manager will build personal relationships with his employees and give the encouragement needed for them to further develop their talents. Profiles International offers the employee productivity improvement tools employers need to staff their organizations with people who are productive, skilled, and committed. Let us show you how to maximize your human capital in ways that result in substantial employee productivity increases and improved employee morale.